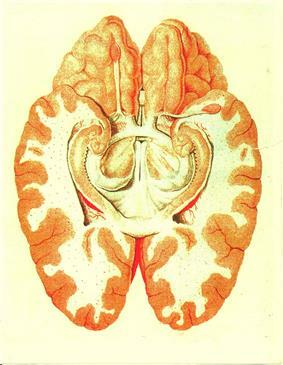 Cross section of the human brain showing parts of the limbic system from below. The limbic system largely consists of what was previously known as the limbic lobe. The limbic system (or paleomammalian brain) is a complex set of brain structures located on both sides of the thalamus, right under the cerebrum. It is not a separate system but a collection of structures from the telencephalon, diencephalon, and mesencephalon. It includes the olfactory bulbs, hippocampus, amygdala, anterior thalamic nuclei, fornix, columns of fornix, mammillary body, septum pellucidum, habenular commissure, cingulate gyrus, parahippocampal gyrus, limbic cortex, and limbic midbrain areas. The limbic system supports a variety of functions including epinephrine flow, emotion, behavior, motivation, long-term memory, and olfaction. Emotional life is largely housed in the limbic system, and it has a great deal to do with the formation of memories. Although the term only originated in the 1940s, some neuroscientists, including Joseph LeDoux, have suggested that the concept of a functionally unified limbic system should be abandoned as obsolete because it is grounded mainly in historical concepts of brain anatomy that are no longer accepted as accurate. The limbic system was originally defined by  The existence of such a system as an isolated entity responsible for the neurological regulation of emotion has gone into disuse and currently it is considered as one of the many parts of the brain that regulate visceral, autonomic processes. Orbitofrontal cortex, a region in the frontal lobe involved in the process of decision-making. Piriform cortex, part of the olfactory system. Entorhinal cortex, related with memory and associative components. Hippocampus and associated structures, which play a central role in the consolidation of new memories. Septal nuclei, a set of structures that lie in front of the lamina terminalis, considered a pleasure zone. Amygdala, located deep within the temporal lobes and related with a number of emotional processes. Nucleus accumbens: involved in reward, pleasure, and addiction. Hypothalamus: a center for the limbic system, connected with the frontal lobes, septal nuclei and the brain stem reticular formation via the medial forebrain bundle, with the hippocampus via the fornix, and with the thalamus via the mammillothalamic fasciculus. It regulates a great number of autonomic processes. Mammilary bodies, part of the hypothalamus that receives signals from the hippocampus via the fornix and projects them to the thalamus. Anterior nuclei of thalamus receive input from the mammillary bodies. Involved in memory processing. The structures of the limbic system are involved in motivation, emotion, learning, and memory. The limbic system is where the subcortical structures meet the cerebral cortex. The limbic system operates by influencing the endocrine system and the autonomic nervous system. It is highly interconnected with the nucleus accumbens, the brain's pleasure center, which plays a role in sexual arousal and the "high" derived from certain recreational drugs. These responses are heavily modulated by dopaminergic projections from the limbic system. In 1954, Olds and Milner found that rats with metal electrodes implanted into their nucleus accumbens, as well as their septal nuclei, repeatedly pressed a lever activating this region, and did so in preference to eating and drinking, eventually dying of exhaustion. The limbic system also includes the basal ganglia. The basal ganglia are a set of subcortical structures that directs intentional movements. The basal ganglia are located near the thalamus and hypothalamus. They receive input from the cerebral cortex, which sends outputs to the motor centers in the brain stem. A part of the basal ganglia called the striatum controls posture and movement. Recent studies indicate that, if there is an inadequate supply of dopamine, the striatum is affected, which can lead to visible behavioral symptoms of Parkinson's disease. The limbic system is also tightly connected to the prefrontal cortex. Some scientists contend that this connection is related to the pleasure obtained from solving problems. To cure severe emotional disorders, this connection was sometimes surgically severed, a procedure of psychosurgery, called a prefrontal lobotomy (this is actually a misnomer). Patients having undergone this procedure often became passive and lacked all motivation. The limbic system is often classified as a “cerebral structure”. This structure is closely linked to olfaction, emotions, drives, autonomic regulation, memory, and pathologically to encephalopathy, epilepsy, psychotic symptoms, cognitive defects. The functional relevance of the limbic system has proven to serve many different functions such as affects/emotions, memory, sensory processing, time perception, attention, consciousness, instincts, autonomic/vegetative control, and actions/motor behavior. Some of the disorders associated with the limbic system are epilepsy and schizophrenia. Various processes of cognition involve the hippocampus. The first and most widely researched area concerns memory, spatial memory in particular. Spatial memory was found to have many sub-regions in the hippocampus, such as the dentate gyrus (DG) in the dorsal hippocampus, the left hippocampus, and the parahippocampal region. The dorsal hippocampus was found to be an important component for the generation of new neurons, called adult-born granules (GC), in adolescence and adulthood. These new neurons contribute to pattern separation in spatial memory, increasing the firing in cell networks, and overall causing stronger memory formations. While the dorsal hippocampus is involved in spatial memory formation, the left hippocampus is a participant in the recall of these spatial memories. Eichenbaum and his team found, when studying the hippocampal lesions in rats, that the left hippocampus is “critical for effectively combining the ‘what, ‘when,’ and ‘where’ qualities of each experience to compose the retrieved memory.” This makes the left hippocampus a key component in the retrieval of spatial memory. However, Spreng found that the left hippocampus is, in fact, a general concentrated region for binding together bits and pieces of memory composed not only by the hippocampus, but also by other areas of the brain to be recalled at a later time. Eichenbaum’s research in 2007 also demonstrates that the parahippocampal area of the hippocampus is another specialized region for the retrieval of memories just like the left hippocampus. The hippocampus, over the decades, has also been found to have a huge impact in learning. CurlikShors examined the effects of neurogenesis in the hippocampus and its effects on learning. This researcher and his team employed many different types of mental and physical training on their subjects, and found that the hippocampus is highly responsive to these latter tasks. Thus, they discovered an upsurge of new neurons and neural circuits in the hippocampus as a result of the training, causing an overall improvement in the learning of the task. This neurogenesis contributes to the creation of adult-born granules cells (GC), cells also described by Eichenbaum in his own research on neurogenesis and its contributions to learning. The creation of these cells exhibited “enhanced excitability” in the dentate gyrus (DG) of the dorsal hippocampus, impacting the hippocampus and its contribution to the learning process. Damage relayed to the hippocampal region of the brain has reported vast effects on overall cognitive functioning, particularly memory such as spatial memory. As previously mentioned, spatial memory is a cognitive function greatly intertwined with the hippocampus. While damage to the hippocampus may be a result of a brain injury or other injuries of that sort, researchers particularly investigated the effects that high emotional arousal and certain types of drugs had on the recall ability in this specific memory type. In particular, in a study performed by Parkard, rats were given the task of correctly making their way through a maze. In the first condition, rats were stressed by shock or restraint which caused a high emotional arousal. When completing the maze task, these rats had an impaired effect on their hippocampal-dependent memory when compared to the control group. Then, in a second condition, a group of rats were injected with anxiogenic drugs. Like the former these results reported similar outcomes, in that hippocampal-memory was also impaired. Studies such as these reinforce the impact that the hippocampus has on memory processing, in particular the recall function of spatial memory. Furthermore, impairment to the hippocampus can occur from prolonged exposure to stress hormones such as Glucocorticoids (GCs), which target the hippocampus and cause disruption in explicit memory. In an attempt to curtail life-threatening epileptic seizures, 27-year-old Henry Gustav Molaison underwent bilateral removal of almost all of his hippocampus in 1953. Over the course of fifty years he participated in thousands of tests and research projects that provided specific information on exactly what he had lost. Semantic and episodic events faded within minutes, having never reached his long term memory, yet emotions, unconnected from the details of causation, were often retained. Dr. Suzanne Corkin who worked with him for 46 years until his death described the contribution of this tragic "experiment" in her 2013 book. Another integrative part of the limbic system, the amygdala is involved in many cognitive processes. Like the hippocampus, processes in the amygdala seems to impact memory; however, it is not spatial memory as in the hippocampus but episodic-autobiographical memory (EAM) networks. Markowitsch's amygdala research shows it encodes, stores, and retrieves EAM memories. To delve deeper into these types of processes by the amygdala, Markowitsch and his team provided extensive evidence through investigations that the “amygdala’s main function is to charge cues so that mnemonic events of a specific emotional significance can be successfully searched within the appropriate neural nets and re-activated.” These cues for emotional events created by the amygdala encompass the EAM networks previously mentioned. ^ Princeton Review (29 July 2003). Anatomy Coloring Workbook, Second Edition. The Princeton Review. pp. 120–. ^ a b Broca, P (1878). "Anatomie comparee des circonvolutions cerebrales: Le grand lobe limbique et la scissure limbique dans la serie des mammifères.". Revue d'Anthropologie 1: 385–498. ^ Morgane PJ, Galler JR, Mokler DJ. (2005). "A review of systems and networks of the limbic forebrain/limbic midbrain". Progress in Neurobiology 75 (2): 143–60. ^ Blessing WW (1997). "Inadequate frameworks for understanding bodily homeostasis". Trends in Neuroscience 20 (6): 235–239. ^ Rajmohan V, Mohandas E (2007). "The limbic system". Indian Journal of Psychiatry 49 (2): 132–139. ^ Olds, J.; Milner, P. (1954). "Positive reinforcement produced by electrical stimulation of septal area and other regions of rat brain". J.Comp. Physiolo. Psycholo 47 (6): 419–427. ^ Adams, R.D. and Victor, M., Principles of Neurology, 3rd edn., MacGraw-Hill, New York, 1985. ^ lversen, S.D., Recent advances in the anatomy and chemistry of the limbic system. In M.R. Trimble and E. Zarifian (Eds. ), Psychophannacology of the Lhnbic System, Oxford University Press, Oxford, 1984, pp. 1-16. ^ a b Kheirbeck, M.A. ; Hen, R. (2011). "Dorsal vs ventral hippocampal neurogenensis: Implications for cognition and mood". Neuropsychopharmacology 36 (1): 373–374. ^ a b c Eichenbaum, H. (2007). "Comparative cognition, hippocampal function, and recollection". Comparative Cognition & Behavior Reviews 2 (1): 47–66. ^ Spreng, R.N. ; Mar, R. A. (2012). "I remember you: A role for memory in social cognition and the functional neuroanatomy of their interaction". Brain Research 1428: 43–50. ^ CurlikShors, D.; Shors, T.J. (2012). "Training your brain: Do mental and physical (map) training enhance cognition through the process of neurogenesis in the hippocampus?". Neuropharmacology 64 (1): 506–14. ^ Parkard, M.G. (2009). "Anxiety, cognition, and habit: A multiple memory systems perspective". Brain Research 1293: 121–128. ^ a b Markowitsch, H.J. ; Staniloiu, A (2011). "Amygdala in action: Relaying biological and social significance to autobiographical memory". Neuropsychologia 49 (4): 718–733. ^ Pessoa, L. (2010). """Emotion and cognition and the amygdale: From "what is it?" to "what's to be done?. Neuropsychologia 48 (12): 3416–3429. ^ Todorov, A.; Engell, A. D. (2008). "). The role of the amygdala in implicit evaluation of emotionally neutral faces". Social Cognitive and Affective Neuroscience 3 (4): 303–312. ^ Koscik, T.R. ; Tranel, D. (2011). "The human amygdala is necessary for developing and expressing normal interpersonal trust". Neuropsychologia 49 (4): 602–611. ^ Rule, N.O. ; Moran, J. M., Freeman, J. B., Whitfield-Gabrieli, S., Gabrieli, J. D. E., , & Ambady,N (2011). "Face value: Amygdala response reflects the validity of first impressions". NeuroImage 54 (1): 734–741. ^ Bruce LL, Neary TJ (1995). "The limbic system of tetrapods: a comparative analysis of cortical and amygdalar populations". Brain Behav. Evol. 46 (4–5): 224–34. ^ MacLEAN PD (1949). "Psychosomatic disease and the visceral brain; recent developments bearing on the Papez theory of emotion". Psychosom Med 11 (6): 338–53. ^ a b P. D. MacLean (1952). "Some psychiatric implications of physiological studies on frontotemporal portion of limbic system (visceral brain)". Electroencephalography and Clinical Neurophysiology 4 (4): 407–418. ^ Binder, Marc D (2009). Encyclopedia of Neuroscience. Springer. p. 2592. ^ Papez, JW. (1995). "A proposed mechanism of emotion. 1937". J Neuropsychiatry Clin Neurosci 7 (1): 103–12. ^ Kluver, H.; Bucy, P. C. (1937). "Psychic blindness" and other symptoms following bilateral temporal lobectomy". American Journal of Physiology 119: 254–284. ^ Robert L, Isaacson (31 December 1992). "A fuzzy limbic system". Behavioural Brain Research 52 (2): 129–131. ^ Simpson, J. A. (November 1973). "The Limbic System" (PDF). J Neurol Neurosurg Psychiatry 39 (11): 1138–1138. ^ Fulton, John (November 1953). "The Limbic System". Yale Journal of Biology and Medicine 26 (2): 107–118. There is controversy over the use of the term limbic system, with scientists such as LeDoux arguing that the term be considered obsolete and abandoned. Originally, the limbic system was believed to be the emotional center of the brain, with cognition being the business of the neocortex. However, cognition depends on acquisition and retention of memories, in which the hippocampus, a primary limbic structure, is involved: hippocampus damage causes severe cognitive (memory) deficits. More important, the "boundaries" of the limbic system have been repeatedly redefined because of advances in neuroscience. Therefore, while it is true that limbic structures are more closely related to emotion, the brain can be thought of as an integrated whole. The first evidence that the limbic system was responsible for the cortical representation of emotions was discovered in 1939, by Heinrich Kluver and Paul Bucy. Kluver and Bucy, after much research, demonstrated that the bilateral removal of the temporal lobes in monkeys created an extreme behavioral syndrome. After performing a temporal lobectomy, the monkeys showed a decrease in aggression. The animals revealed a reduced threshold to visual stimuli, and were thus unable to recognize objects that were once familiar. MacLean expanded these ideas to include additional structures in a more dispersed "limbic system," more on the lines of the system described above. MacLean developed the intriguing theory of the “triune brain” to explain its evolution and to try to reconcile rational human behavior with its more primal and violent side. He became interested in the brain’s control of emotion and behavior. After initial studies of brain activity in epileptic patients, he turned to cats, monkeys, and other models, using electrodes to stimulate different parts of the brain in conscious animals. Furthermore, He then recorded the animals’ responses and, in the 1950s, he began to trace individual behaviors like aggression and sexual arousal to their physiological sources. He analyzed the brain’s center of emotions, the limbic system, and described an area that includes structures called the hippocampus and amygdala. Developing observations made by Papez, he determined that the limbic system had evolved in early mammals to control fight-or-flight responses and react to both emotionally pleasurable and painful sensations. The concept is now broadly accepted in neuroscience. Additionally, MacLean said that the idea of the limbic system leads to a recognition that its presence “represents the history of the evolution of mammals and their distinctive family way of life.”In the 1960s, Dr. MacLean enlarged his theory to address the human brain’s overall structure and divided its evolution into three parts, an idea that he termed the triune brain. In addition to identifying the limbic system, he pointed to a more primitive brain called the R-complex, related to reptiles, which controls basic functions like muscle movement and breathing. The third part, the neocortex, controls speech and reasoning and is the most recent evolutionary arrival. The concept of the limbic system has since been further expanded and developed by Walle Nauta, Lennart Heimer and others. The limbic system is a term that was introduced in 1949 by the American physician and neuroscientist, Paul D. MacLean. The French physician Paul Broca first called this part of the brain le grand lobe limbique in 1878. He examined the differentiation between deeply recessed cortical tissue and underlying, subcortical nuclei. However, most of its putative role in emotion was developed only in 1937 when the American physician James Papez described his anatomical model of emotion, the Papez circuit. The term limbic comes from the Latin limbus, for "border" or "edge", or, particularly in medical terminology, a border of an anatomical component. Paul Broca coined the term based on its physical location in the brain, sandwiched between two functionally different components. Damage to the structures of limbic system results in conditions like Alzheimer's disease, anterograde amnesia, retrograde amnesia, and Kluver-Bucy syndrome. However, while the categorization into structures is reasonable, the recent studies of the limbic system of tetrapods, both living and extinct, have challenged several aspects of this hypothesis, notably the accuracy of the terms "reptilian" and "old mammalian". The common ancestors of reptiles and mammals had a well-developed limbic system in which the basic subdivisions and connections of the amygdalar nuclei were established. Further, birds, which evolved from the dinosaurs, which in turn evolved separately but around the same time as the mammals, have a well-developed limbic system. While the anatomic structures of the limbic system are different in birds than in mammals, there are functional equivalents. According to Maclean, each of the components, although connected with the others, retained "their peculiar types of intelligence, subjectivity, sense of time and space, memory, mobility and other less specific functions". 3 - The neopallium, also known as the superior or rational ("new mammalian") brain, comprises almost the whole of the hemispheres (made up of a more recent type of cortex, called neocortex) and some subcortical neuronal groups. It corresponds to the brain of the superior mammals, thus including the primates and, as a consequence, the human species. It should be noted that similar development of the neocortex in mammalian species unrelated to humans and primates has also occurred, for example in cetaceans and elephants; thus the designation of 'superior mammals' is not an evolutionary one, as it has occurred independently in different species. The evolution of higher degrees intelligence is an example of convergent evolution, and is also seen in non-mammals such as birds. 2 - The paleopallium or intermediate ("old mammalian") brain, comprising the structures of the limbic system. 1 - The archipallium or primitive ("reptilian") brain, comprising the structures of the brain stem - medulla, pons, cerebellum, mesencephalon, the oldest basal nuclei - the globus pallidus and the olfactory bulbs. Social processing, specifically the evaluation of faces in social processing, is an area of cognition specific to the amygdala. In a study done by Todorov, fMRI tasks were performed with participants to evaluate whether the amygdala was involved in the general evaluation of faces. After the study, Todorov concluded from his fMRI results that the amygdala did indeed play a key role in the general evaluation of faces. However, in a study performed by researchers Koscik and his team, the trait of trustworthiness was particularly examined in the evaluation of faces. Koscik and his team demonstrated that the amygdala was involved in evaluating the trustworthiness of an individual. They investigated how brain damage to the amygdala played a role in trustworthiness, and found that individuals that suffered damage tended to confuse trust and betrayal, and thus placed trust in those having done them wrong. Furthermore, Rule, along with his colleagues, expanded on the idea of the amygdala in its critique of trustworthiness in others by performing a study in 2009 in which he examined the amygdala's role in evaluating general first impressions and relating them to real-world outcomes. Their study involved first impressions of CEOs. Rule demonstrated that while the amygdala did play a role in the evaluation of trustworthiness, as observed by Koscik in his own research two years later in 2011, the amygdala also played a generalized role in the overall evaluation of first impression of faces. This latter conclusion, along with Todorov’s study on the amygdala’s role in general evaluations of faces and Koscik’s research on trustworthiness and the amygdala, further solidified evidence that the amygdala plays a role in overall social processing.